According to the recent CIO survey by Gartner, 95% percent of CIOs expect their jobs to change or be remixed due to digitalization. While world-class IT delivery managementis a given, it will take up less and less of the CIO’s time. The CIOs believe that the two biggest transformations in the CIO role will be becoming a change leader, followed by assuming increased and broader responsibilities and capabilities. Inevitably, the job of CIO will extend beyond the traditional delivery roles to other areas of the business, such as innovation management and talent development. 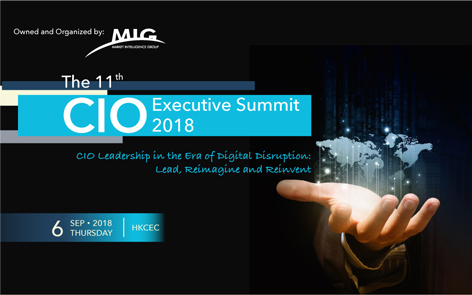 This year, the summit carries the theme of “CIO Leadership in the Era of Digital Disruption: Lead, Reimagine and Reinvent". Targeting 200+CIOs and C-level delegates for Hong Kong, this premier annual CIO event seriesdedicates in optimizing delegates’ business information technology management with a new strategic outlook and equips CIOs with insight into how to make changes to their roles, organizations, environments and leaderships to advance the digital transformation journey of their organizations. Standard Rate: Members meeting the target audience requirement can enjoy complimentary entry. For any queries, please do not hesitate contact to Mr. Donnie Chan at (852) 3563 5869 / donnie.chan@mig-events.com or contact us at keith@hkfec.org.